Please leave your email and we’ll notify you with a discount code when we’re available in your area. Today's your day - we deliver to you! 1. Can I choose the flavours that are included in my box? A: All our boxes include our set mixed flavours. The only exception to this is if you want to order 1 dozen of the same flavour or 1 dozen with two flavours. We require confirmation of this by 5pm the day before your delivery date. 2. Do your cupcakes cater to coeliac and nut allergies? A: Unfortunately, gluten free cupcakes are temporarily unavailable and all of the cupcakes (including vegan cupcakes) are made from wheat flour. Please note our Never Enough Nutella does contain nuts. If required this cupcake can be removed from the box in the case of a severe nut allergy. 3. What time should I expect your cupcakes? A: Orders must be in by 11am for same day delivery. You will receive our cupcakes anytime between 11:00am to 4:00pm on the day. Our driver will contact you in advance if your order is running late and might arrive after 4:00pm. 4. I work in Sydney CBD, do I have to pay for the delivery fee? A: Congrats! You can enjoy our free delivery service. We deliver free of charge to anywhere within 20km radius from Sydney city. 5. We want to keep the cupcakes for the weekend, how should I store them? A: Please keep them somewhere cool and dry and consume within 3 days. Don’t store them in the fridge as they might go dry and are not as enjoyable. 6. What happens when I have accidentally provided wrong delivery address? A: Unfortunately, we don’t redeliver the order for free when the customer fails to provide correct delivery address. Our customer service staff will contact you when this happens, you could either schedule next day self-pickup at our office, or pay $30 delivery fee to get the order redelivered the next day. We strongly advise you to confirm the delivery address with the recipient so as to make sure we don’t miss the date. Anniversary, new love or just because! 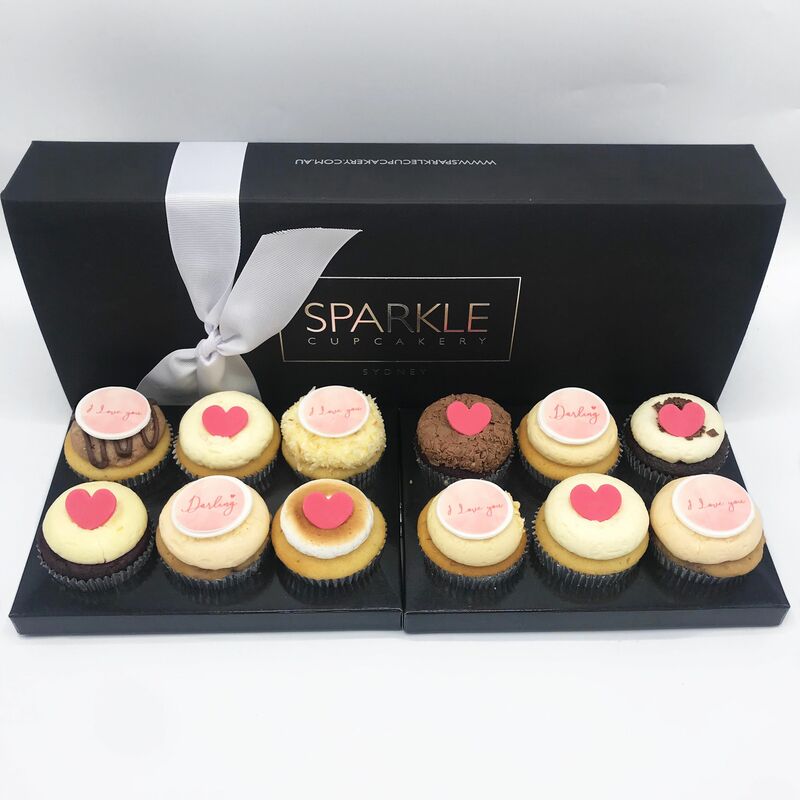 A selection of our freshly baked Sparkle flavours topped with edible words "I Love You" “Darling” and red love hearts. Please note we are closed on public holidays.